Only 4 of 25 members of a Senate committee were in attendance to hear Potter's scathing critique of health care insurers. 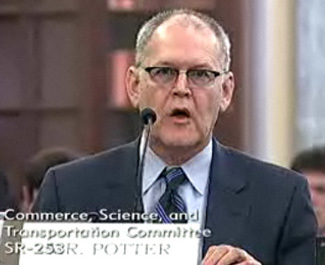 “My name is Wendell Potter and for 20 years, I worked as a senior executive at health insurance companies, and I saw how they confuse their customers and dump the sick—all so they could satisfy their Wall Street investors.” So the former head of corporate communications and chief corporate spokesman at insurance giant CIGNA began his testimony before the Senate Committee on Commerce, Science and Transportation last month. Potter had a lot to say, but hardly anyone to tell his story to: only four Senators, three Democrats and one Republican, were present to listen to him. At least 46 million Americans are uninsured and 25 million more are underinsured, meaning that they have some insurance but are unable to cover the full cost of their medical needs. In the debate over the future of health care, Potter has emerged as an advocate for the public option, arguing that the insurance industry has misled and short-changed customers for bigger profits. Now a senior fellow on health care at Center for Media and Democracy, Potter has been debunking industry spin on his blog and in media appearances, including a July 10th interview on the Bill Moyers Journal. Potter’s argument is simple: Insurance companies have been spending less and less of their customers’ money on paying for medical care and pocketing more and more of it. According to PricewaterhouseCoopers, for the seven largest insurers, the medical loss ratio—how much of a premium dollar is used to pay medical claims—fell from 85.3 percent in 1998 to 81.6 percent in 2008. The result, says Potter, amounts to several billion of dollars for those insurance companies and a plunge in stock value for those companies that fail to continually cut their medical costs. The soaring profits have been achieved by pushing unprofitable patients off the rolls, denying coverage, jacking up premiums and selling plans that provide little coverage. Rescission is one way in which insurers have sought, as Potter puts it, to “meet Wall Street’s relentless profit expectations.” Insurance companies will cancel a policy claiming that customers failed to disclose key information about their condition, even in cases where the companies themselves recorded that same information. An investigation by the House Energy and Commerce subcommittee on oversight and investigations found that health insurers WellPoint Inc., UnitedHealth Group and Assurant Inc. canceled the coverage of more than 20,000 people, avoiding paying out more $300 million over a five-year period. They targeted people with serious conditions such as breast cancer, lymphoma and high blood pressure. When Rep Bart Stupak (D-Mich) asked the heads of the three insurers if they would eliminate the practice of dropping sick patients off the rolls except in those cases of “intentional fraud,” all three refused. When customers do take advantage of their health insurance and receive costly treatment, they and their employers are punished by way of sharp raises on their premiums. In 2006, CIGNA informed the Entertainment Industry Group Insurance Trust that some of their employees’ premiums would exceed their salaries. Small business have been particularly hard hit by the premium hikes. According to the National Small Business Association, the percentage of small businesses offering coverage declined from 61 percent in 1993 to 38 percent today. Industry consolidation has meant that there are fewer alternatives for these newly uninsured. After a series of acquisitions in the late 1990s, Aetna became what was then largest health insurer, boasting 21 million members. The company proceeded to spend some $20 million on its computer systems, a measure that allowed it to more easily identify the less profitable accounts. In 2000, it raised premiums and eventually was able to shed some 8 million members. The insurance industry does want the uninsured to have insurance, or at least the appearance of it. “The number of uninsured people has increased as more have fallen victim to deceptive marketing practices and bought what essentially is fake insurance,” Potter said at the sparsely attended Senate hearing. As an example of one of the many “limited benefit” plans, Potter cited CIGNA’s StarBridge, which doesn’t initially cover pre-existing conditions, requires an annual employee turnover of 70 percent and an average age of no higher than 40. In such plans, employees are left paying for the whole of their premiums, while the restrictions practically assure that the insurance companies make a profit. The turning point for Potter’s view of the health care industry came in 2007 when on a visit home to Tennessee, he saw an advertisement for a health care expedition in Vise, Virginia. He drove to the Wise County Fairground expecting to see neat booths in which people got their blood pressure checked. “What I saw were doctors who were set up to provide care in animal stalls,” Potter told Moyers. People from across much of the South stood in longs lines in the rain to receive cost-free care. Your State Rep. will stand their and tell you horror stories of how a Gov. plan will sell you short when they are on a gov. plan and love thier healthcare. Tell you how much it costs when in reality they now spend 80 cents (and going lower) of every dollar on care. When medicare, which needs major inprovement spends only 3% on over head. Now who do you think is going to stand in your way of getting care the gov. or the corprate CEO who has lowered the 95 cent spent on care in 1993 to the 80 cents in 2008. Accomplishied by dropping people who were paying for ins. and by refusing to pay for peoples care that was recomended by thier docter. All for profits for wall street, lobbyist so they can spin misinformation and untruths, and last but not least donate money to State Representatives and Congressmen so they can get reelected so they can keep representing BIG INSURANCE,BIG PHARMA AND THE REST OF THE MEDICAL INDUSTRY THAT ISN'T TRYING TO DO THE RIGHT THING.